Public Art Fund announces Please Touch the Art, a major new exhibition by Danish artist Jeppe Hein featuring 18 playful sculptures designed specifically for public interaction at Brooklyn Bridge Park. Engaging visitors through pieces that are both accessible and surprising, the show includes three distinct bodies of work: Appearing Rooms, a series of “rooms” formed when water shoots up from the work’s gridded base forming “walls” that appear and disappear throughout the day; a large new Mirror Labyrinth, featuring equidistantly spaced vertical elements at varying heights made from mirror-polished stainless steel that multiply the surrounding landscape through myriad reflections; and 16 new Modified Social Benches that upend the idea of a traditional park bench with their unconventional angled, curved, twisted, and bent forms. The most comprehensive exhibition of his work ever presented in public space in the United States, Jeppe Hein: Please Touch the Art is on view May 17, 2015 – April 17, 2016 at Brooklyn Bridge Park. 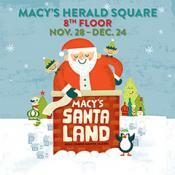 Santa is stopping by your favorite Macy's! It's the perfect opportunity to share everything on your holiday wish list. He's only here for a limited time, so catch him while you can! Have your photo taken with the man himself! This holiday season, bring Christmas to life for your family with a magical morning at Stella 34 Trattoria. Make their Christmas dreams come true when they meet and have breakfast with Santa Claus (and his elves) in the store that brought you the Miracle on 34th Street! Whether you have been naughty or nice this year, Breakfast with Santa is the ultimate delight, even for the biggest scrooge! Spend an action packed Saturday with Jolly Ol' Saint Nick and the elves for a fantastically festive, fun-filled breakfast buffet cruise - complete with interactive games, DJ and dancing! Don’t miss out on this great event, get your tickets before it sells out! CONTINENTAL BREAKFAST includes assorted variety of mini yogurts, bagels, donuts and pastries. Coffee, Orange Juice and Water served. The Christmas Village in NY is a walk-through exhibit of twenty-one fabulously decorated scenes, with audio-animatronic elves, animals, people, and machines operating throughout. There is nothing like it anywhere in The City. Visitors get a guided tour telling the whole story of how Santa wanted a Village here as a home away from home. Admission price comes with a colorful pass the guests keep as a souvenir. Various photo package options to purchase. Some of the scenes include Santa arriving on his reindeer-drawn sleigh to a NYC Yellow Cab, the North Pole Depot featuring a huge replica train, Santa’s Workshop with elves working away making toys, the Claus Home, Mrs., Claus’ Sweet Shoppe for baking his favorite cookies, the Pizza Christmico shop for his favorite snack, Rudolph’s Barn where all the reindeer play, an Arctic Scene with a family of Polar Bears, a NYC skyline complete with a mechanical vintage plane like the ones that King Kong fought on the Empire State Building, a revolving Christmas Tree Carousel, and a dozen more scenes, including a traditional Nativity. Upstairs is our huge Christmas in NY gift store, where we feature hundreds of ornaments that are not available anywhere except our stores and our website. We personalize for free, so many people get a cherished keepsake for themselves, friends, or family. The Flatiron/23rd Street Partnership Business Improvement District unveiled its fourth annual “23 Days of Flatiron Cheer” season, complete with a neighborhood-wide scavenger hunt, performances, contests, hot beverage giveaways, “Holiday Happys” happy hours and much more. The centerpiece of the festivities is a dynamic, interactive installation – Nova – set on the North Public Plaza in the shadow of the famed Flatiron building.